... Well then, shame on me. This time, I'm referring to McCall's 5892. (And the first time, it was Vogue 1046.) It reads like a mystery in three parts, or maybe more like an episode of Blue's Clues. Not the full-on cartoon newer ones, but the original ones, with Steve, where Blue doesn't talk. Ignored Clue #1: No printed bust measurement. A dress with no bust measurement on the front bodice pattern piece is shouting at me to walk away, but twice now I've taken the bait. Because I hope that, this time, the system will work in favor of my stature? I had a yard of this plaid linen, which was 60" wide, and I really wanted to sew something from it for the imminent Texas summer heat. I bought the pattern last summer, drawn in by how quick I figured it would be to sew, and how comfy it would be despite the sun. Last night, having matched the linen to the pattern, I decided to read what other sewists had to say about M5892. Ignored Clue #2: No one in the world had sewn this and written on the web about it. I searched patternreview.com AND Google and could not find one review, blog post, etc. from anyone who'd sewn this dress. Ladies (and the occasional gentleman), I am clearly the only person in the cosmos who bought this pattern. And I'm obvz. the only one insane enough to sew it up! Now that I've looked up the pattern on the McCall's site, I see that it's already OOP. Of course! Why continue to print a pattern that has only sold one copy????? Actually, it reminds me very much of the Japanese pattern book dresses, which are fairly oversized, simply constructed, and meant to be photographed with the model looking doe-eyed and winsome and holding something random. Gotta work on that doe-eyed, winsome thing. And holding a power tool doesn't help portray softness and helplessness and vulnerability, does it? Well, it was laying about so there you go. And when I say oversized, I mean oversized. 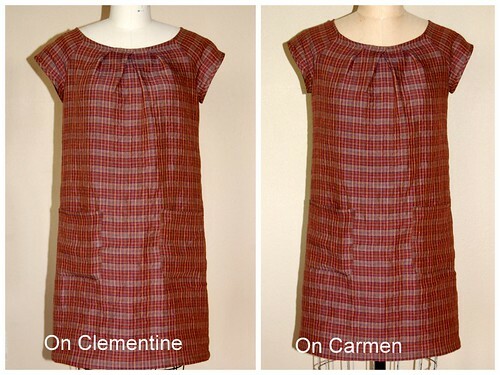 Here's the dress on Clementine (size 2) vs. Carmen (size 6/8). I thought it would be obvious from photos, but it isn't. I promise, it looks much better on Carmen. The armholes are a tad high for a 6/8 person to feel full range of motion, though. Ignored Clue #3: The dress does not look flattering on the pattern envelope model. Granted, she looks much bustier than I, which can make a sack-wearer appear matronly. But if there are va-va-voom curves under there you couldn't tell from this dress. It's quite sacklike. Looking at the bodice pattern pieces, it's clear there is almost no shaping at the waist, and you put the dress on by slipping it over your head. Translation: SACK. The center front pleat instructions were confusing. I guessed, I think I got it right, and I don't love how they turned out. Could also be the stiffness of the linen. I wasn't about to line a casual summer dress, as instructed, so I bias faced the neckline and bias bound the sleeves. The neckline is WIDE! I'd never sewn pure linen before and really appreciate how easy it is to finger-press it! Took my usual 1" petite adjustment at the waist, but then again -- WHAT WAIST? No visible definition on the finished garment. I might shape that waist a teensy bit more at the side seam and see what happens. The entire sewing process took 2.5 hours, and I'd say a good hour was spent just monkeying with the patch pockets, facing the neckline, and binding the armholes. This was a great "get your mojo back" quick garment that is as close to instant gratification as you can get. Linen is a much more sustainable fabric than cotton. Happy times for sewing from new fabric. I was able to cut the entire dress from 1 yard of fabric, without cutting anything on the cross-grain, though I had to downsize the pockets just a tad. As you can imagine, no plaids match across the sleeves or with the patch pockets, and there were just strips and scraps left. I appreciate that feeling of almost no waste!!! I appreciate less the feeling of almost no waist. Haha! Well then, ladies (and the occasional gentleman), so ends this chapter of the riveting mystery of the Trickster Dress a.k.a. M5892. What? You say you had it figured out from the start? Next time, be sure to send me an email and let me know. Sometimes I want a dress to work out more than I want to pay attention to reality. Hahahahaha! You holding a drill had me laughing hysterically. My kids came running over to see what was so funny. But being 4 and 2 they didn't get it. Could you remove the pockets and wear a belt? oh, i think that we have all been there when choosing patterns. at least it should make a cool housedress for the summer! and you can post something on patternreview so no one else falls into the same trap you did (although I'm not always smart enough to check there first - I usually check after I'm finished and determine that other people did indeed have the same issues I did). I really hate McCalls patterns. They must not proofread or even test them. Despite your challenges, I think that the dress is darling. Love the power tool! Well, if shaping and/or belting it doesn't work, then as mjb said, it would make a good house dress for a hot evening or weekend. I love the photo shoot! And love the review. With all the trouble, it turned out adorable! 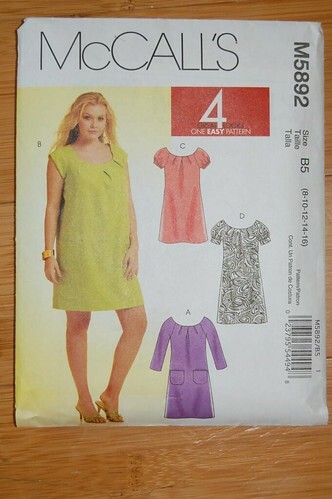 I think McCalls discontinued this dress to hide how many of the exact same sack dress patterns they have. I actually think it's pretty cute, but I know what you mean - I don't like oversized either, I feel like I'm wearing a tent! Have you tried it with a big belt? Might help, might not with the extra fabric. 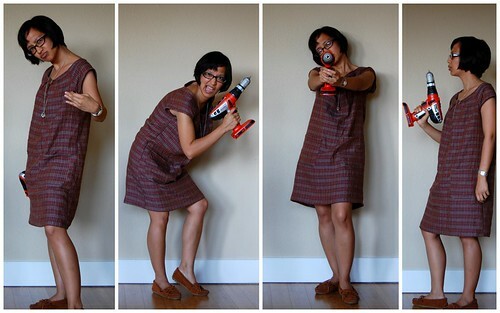 The power drill photo is hilarious - love your blog! Antoinette, you totally had me cracking up the whole time I was reading this! The fabric is such a gorgeous way to stay cool in Austin [I don't know how you all do it] ... I wonder if you could refashion it into something else? I like it - I think you've got "I made it" you know where all you think about is how it's not quite what you had in mind, but if you saw it on someone else you'd say "cute dress". If it was me, all I'd do is funk up the pockets. Cut out something a little bit different and resew them on the bias so you get a nice diagonal effect. But then that's me and my pocket lurve. Yeah, I'm not sure how that pattern envelope tempted you exactly, but it doesn't look as bad on you as it does on the model. Is that a consolation? I'm shocked that you found the armholes high! I find that anything that's meant for the even remotely plus sized world (um, yeah, how did you think a plus sized dress would be anything less than tent-like?) has enormous drooping armholes that expose the entirety of your bra. So, I guess that's one thing they got (almost) right. Please, just get rid of that pattern. Do continue with linen and power drills, however, they are clearly the winners here. The dress looks way better on you than on the model pictured on the envelope. Clearly this is a dress designed for boyish figures. I quite like sack-like dresses on myself, if they are made in a drapey fabric. I think it looks cute on you, way cuter than the model on the envelope. LOVE your montage of power drill photos. Looks like a fun photo shoot! Gotta love a lady with power tools! Love this post :) I keep buying dress patterns that i think are going to be really cute and they look really awful on the pattern...i don't know why i think they are going to turn out so different, i'm only just starting to sew so i don't even know how to alter things yet?? u crack me up. nice that you are the only woman on the earth with that dress now! how rare you are, hummingbird!! when i noticed the power tool, i totally laughed out loud. so do you like the dress, i feel like that's the one thing you didn't say! i actually like it on you a lot. i kind of like sack dresses. 2 and half hours! that's so quick. i am often a snail when sewing i think. i want to give it a try, a 2 and a half hour dress. are you a size 2? pffff! I need to pose with power tools WAY more often. It's a great look! Chicks with power tools...AWESOME!!! The dress is cute. Either belt it or shorten it. It'll go from cute to chic. I really, really, really love the drill photos. Maybe my favorite blog photos of the year. Not kidding. And I need to know if you have a staff photographer or a little clicker for camera and a tripod. For some reason i need to know. Loved this post about your sack adventure. love the "random object" pictures! Your review is a scream! I think power tools make any woman look both winsome and doe-eyed, if that makes you feel any better. The dress looks far better on you than it does on the envelope model. I especially like the fabric you selected and the pockets, which add a certain something. It may not be quite what you had in mind, but it looks quite comfy and cute enough to wear around town on relaxed weekend expeditions. oh it's not that bad, come on. Pattern picking is as much as an art as making the damn pattern. It is straight out of a japanese craft book that's for sure. And yeah, what is up with the random props they give them to hold? I've seen a grown woman holding a carrot and still looking infinitly cooler than me. I think the dress goes quite nicely with your power tool. I remember looking at that pattern, and thinking it looked quick and easy and liking the neckline. Hahahah... drill gun? That's too funny! I actually think the dress is cute on you! It would perfect for this humid hot weather we have going right now. @Jodi - That's what I'm here for -- really encouraging LOL! @mjb - I love checking patternreview.com to commiserate, not to do research beforehand! You are skilled. ;) Great suggestion; I will try to post a review this week though I don't think anyone else owns this pattern. @glam.spoon - I try and try to keep the posts short, but I just don't talk that way so it's a struggle to write that way. I'm glad I finished the dress, too. @Miss Prickly - Most of my dresses from patterns are Simplicity, and my experience with McCall's has been a mixed bag -- some come together easily and some are a struggle in some way or another, or fit crazy. @Sarah - Too late, I've worn it in public! And believe it or not (I was surprised! ), it got a couple of compliments. @Cindy - Thanks so much. I prob. exaggerated how many problems there were -- it was quite simple to put together not counting the front pleat instructions. @Molly Dee - Can I say that after wearing it for a day, it is PERFECT for a hot summer in the ATX? @stitchywitch - Thanks! Haven't tried belting. It has fall-friendly colors, so when it doesn't make me nauseous to have fabric against my body, I will try the belt. Great suggestion. @jessica - I will prob. keep with this dress for the summer. If it doesn't transition to other seasons well, I can see refashioning it into something else. The front and back are just big pieces of fabric, so there's lots of potential for that if the time comes. @Mary Nanna - You may have hit that nail on the head. I tried laying out the pockets on the bias but would have had to seriously downsize them to fit. Maybe I should have anyway? That is a benefit of plaid, that snazzy bias contrast. @Violet - I have been trying to get away from the sackishness this year, but a semi-fitted dress sure beats a fitted dress for comfort during a hot summer. @Kyle - Thanks so much. I love the ease of digital photography! @Alexandra Mason - There are so many times someone will sew an amazing garment, and when I see the pattern envelope I would never have chosen it! Not sure that was quite the case with this dress, but seeing hidden potential happens. @heather - Despite my reservations, the dress wore well. The neckline is a little wide and I adjusted it a lot during the day. I wear a RTW size 0 normally, but I am pretty sure this will fit a RTW 2 or 4 very handily. If one was on the larger-framed side of 4, I'd say to drop those armholes by an inch for sure. @melissa - See? The secret to sewing success is in the power tools. Haha. @RiAnge - Shortening it was the next option on my list to "chic" it up! We'll see how it does the rest of the summer. Shortening the hemline is an easy and quick fix. @ginger - I have the remote clicker. On this day, I used an empty laundry basket, turned upside down on the sofa, instead of tripod. I like really secure getups for my camera like that. Thanks! @amelie - When I finally sew Rooibos in all its delicacy, I will have to take some drill photos. @nopinkhere - Thanks. It's all about those Japanese pattern books. @Maria - Thank you! I think the dress will work out fine. Not that I'm tempted to make another. @meg - I think I've seen that carrot photo! With the dirt straight from the ground? Yeah, I think I am going to take this random object thing to the extreme for the rest of the year. @Angela - I wore it to the last project review meetup and it was received very well, to my surprise! Hope to see you at another meetup soon. What, you couldn't find a chainsaw to hold instead? Back in the ice ages, Vogue Patterns included waist, shoulder, bust and hip measurements on all their patterns, this made them one of the go-to patterns. They were great and never failed. This doesn't seem like much till you start making alterations to the dress. When you have to do that without knowing where the pattern means the waist to be, it gets to be a real guessing game. Thanks for a great laugh and the photo shoot took the cake. The dress looks cute - good fabric choice. I totally understand things coming out crazy baggy. I have learned to rely on the finished garment bust meas too. @Trish - Chainsaw! I am on it! @ClaireOKC - Good point about those measurements. Many of the Big 4 print them, but in a variety of places. Butterick is not only usually the worst fit of the Big 4 for me, but also the epitome of hunt and peck for measurements from among the pattern envelope and the pattern pieces themselves! @Edris - The finished measurements are def. the most reliable, aren't they?